'Tis the Season to Confess : Reform worship. 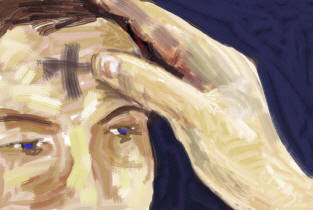 Every Wednesday during Lent, at 7:00am, Noon, and 6:00pm, we are holding Lenten Prayer Services. The idea is to re-focus our hearts on the purposes of the season: repentance and preparation for the highest point in the life of the church - the death and resurrection of Jesus. What we did yesterday during each of these times was go through a Psalm of lament. At 7:00, we prayed through Psalm 3, pausing after every two verses, reflecting, and praying whatever the Lord put on our hearts. We did the same thing at Noon, only we prayed through Psalm 4. And at 6:00pm the group prayed through Psalm 5. The Noon prayer gathering was particularly powerful for me, as about twelve of us prayed through Psalm 4. There was a moment when we paused after verse 4, "Search your hearts and be silent," that we spent a minute in silence, asking God to search our hearts. He began exposing individual sins, and after the minute several people, one by one, began confessing their sins of laziness, fear, desire for other things before God, and many others. I reminded the group that God tells us to confess our sins to one another, and that if we do confess our sins He is faithful and just to forgive us and to purify us from all unrighteousness. This was an incredibly freeing moment for me and I do believe for many others. 'Tis the season to openly confess your sins.